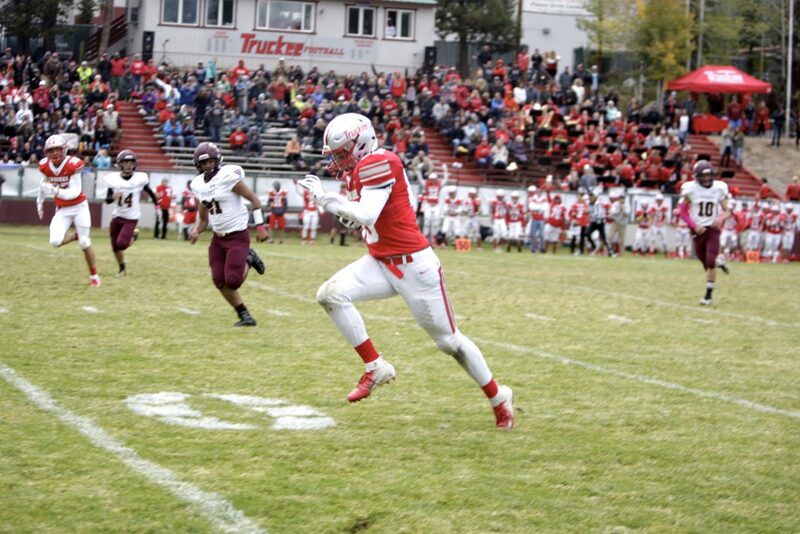 Senior Brennen Conklin races toward the end zone for one of his two touchdowns in Truckee's 50-7 win against Sparks. 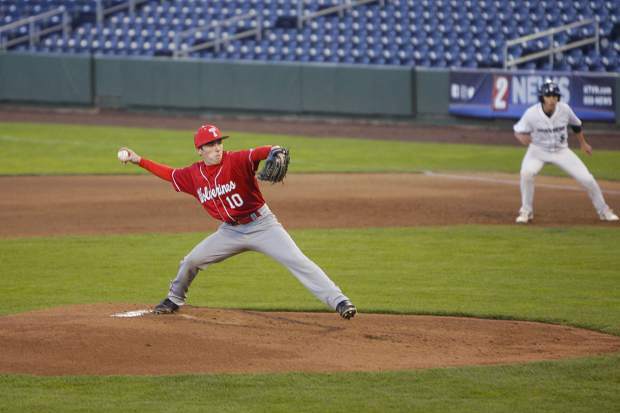 Offensive statistics Passing: M. Bellon 9-13-2-202, D. Allen-Gill 2-2-1-34. 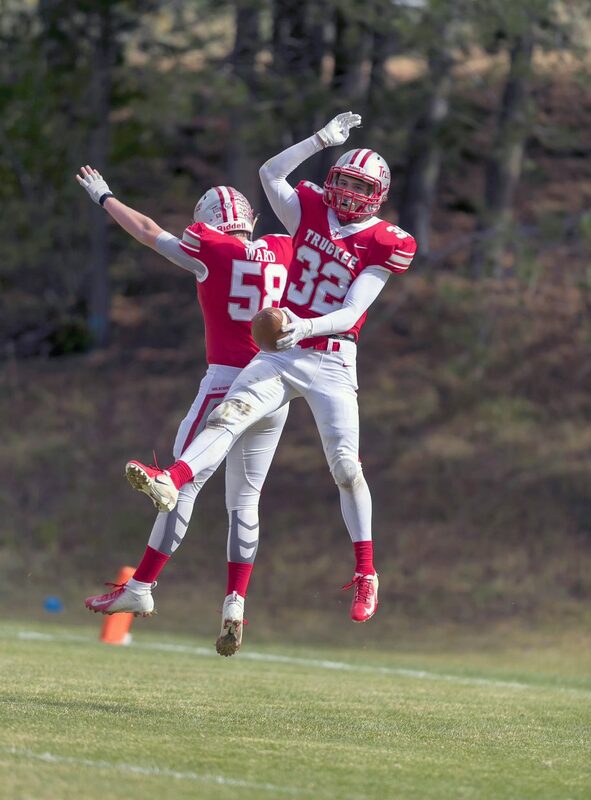 Rushing: K. Malo 8-63, T. Estabrook 2-54, J. Skaff 4-50-1, M. Trotter 2-41-2, B. Conklin 1-25, C. McMullen 2-9, D. Allen-Gill 1-6, D. Laferriere 1-6, D. Mehler 10. 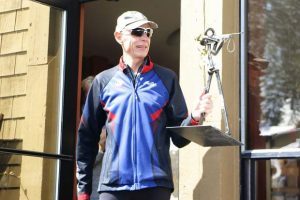 Receiving: B. Conklin 2-71-2, K. Malo 2-40, G. Skaff 1-35, M. Trotter 2-24, D. Wingard 1-24, T. Estabrook 1-20-1, D. Allen-Gill 1-20, D. Laferrier 1-2. 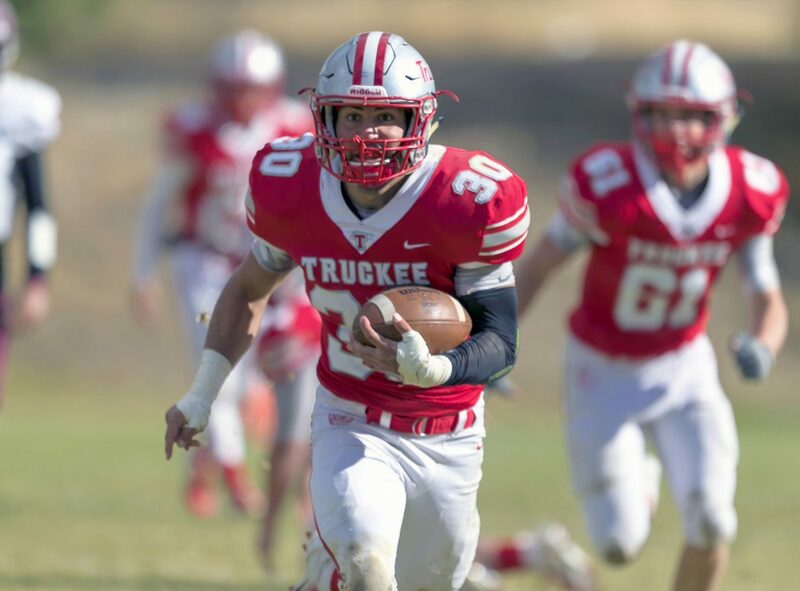 The Truckee football team rolled to a fourth consecutive victory on Saturday, Oct. 6, handing Sparks a 50-7 loss at Surprise Stadium. 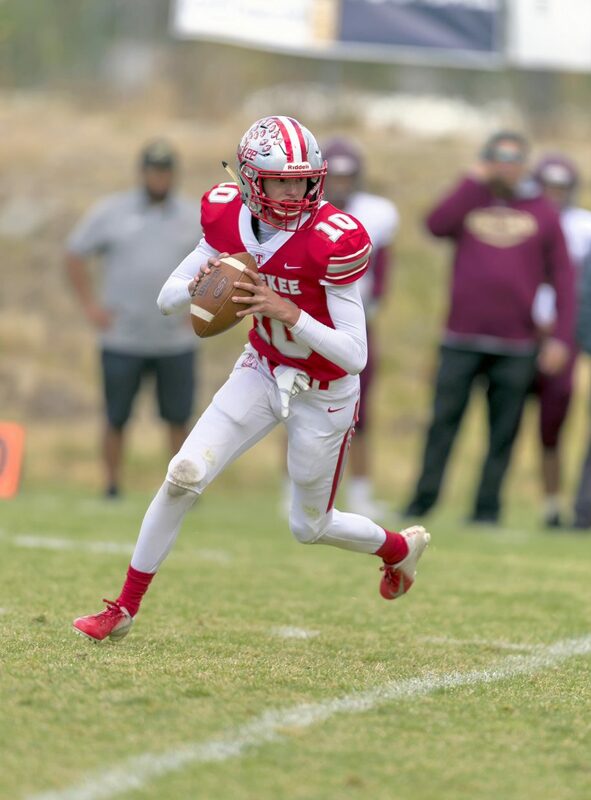 The Wolverines struggled early on with penalties, resulting in a 7-0 lead for the Railroaders after the first quarter of play, but from then on it was all Truckee as the team reeled off seven unanswered touchdowns. 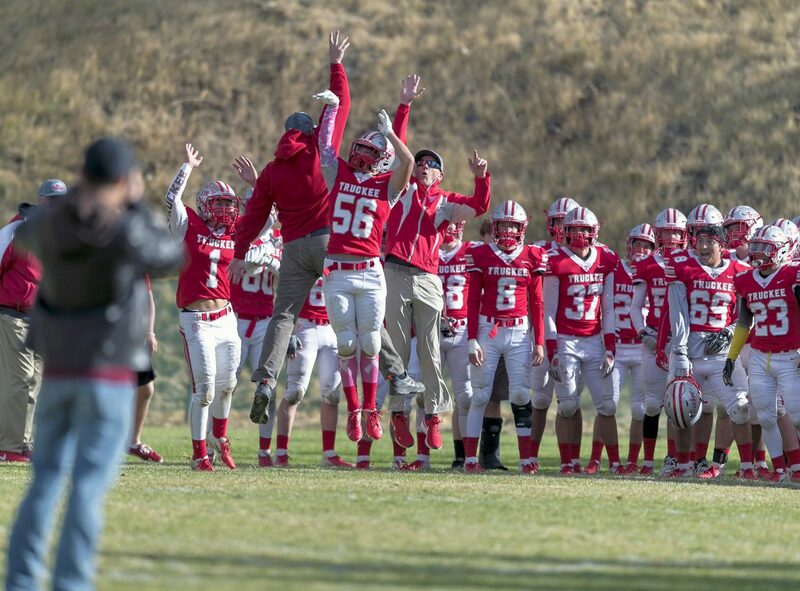 Senior Brennen Conklin got Truckee on the board in the second quarter, hauling in a 59-yard touchdown pass from senior Marcus Bellon on third and long. 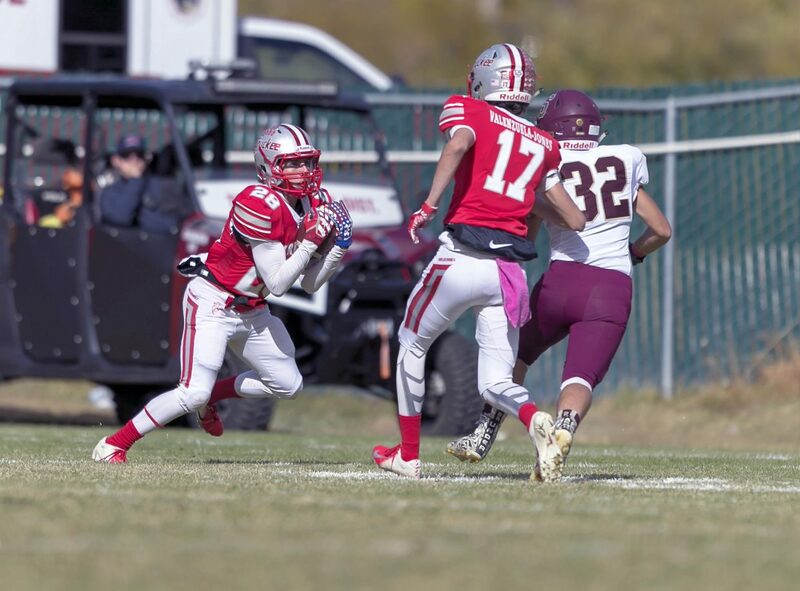 Bellon would finish the game 9 of 13 through the air for 202 yards and two touchdowns. 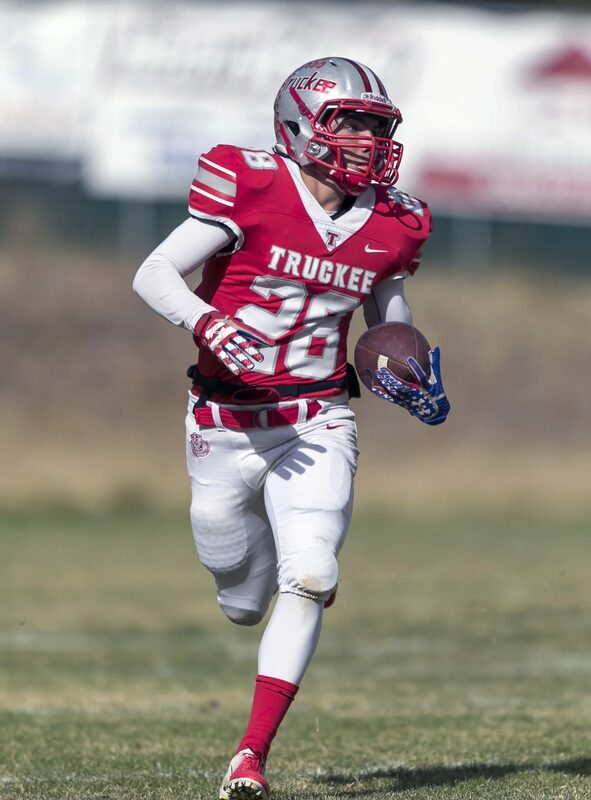 Truckee struck again on its next possession as senior running back Marcus Trotter bounced off several tackles to score from 4 yards out. 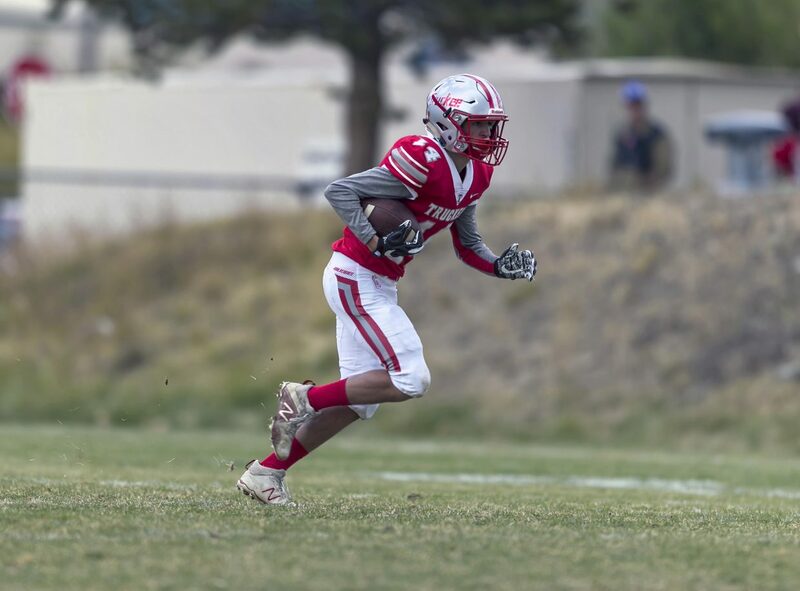 Trotter added another touchdown on the following series, taking a handoff up the middle and going untouched on a 37-yard run. 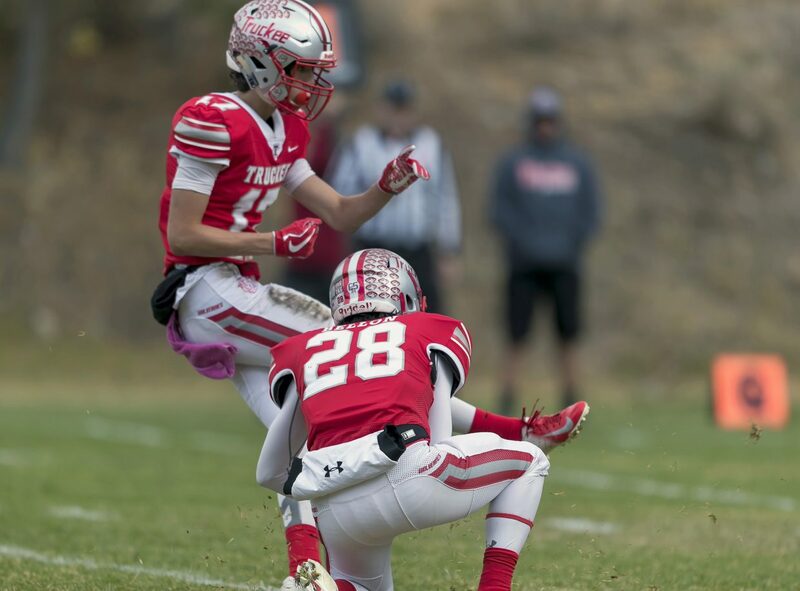 With time running out in the first half the Truckee defense forced a stop and a punt. 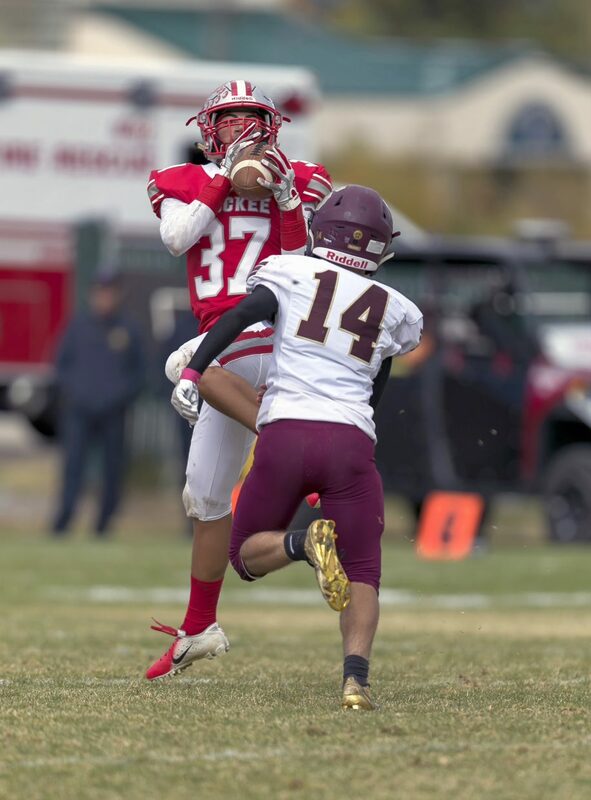 Bellon went back for the return, caught the ball at the 15-yard line, and then made nearly every member of the Railroaders coverage team miss on a spectacular 85-yard punt return for a touchdown as time expired. 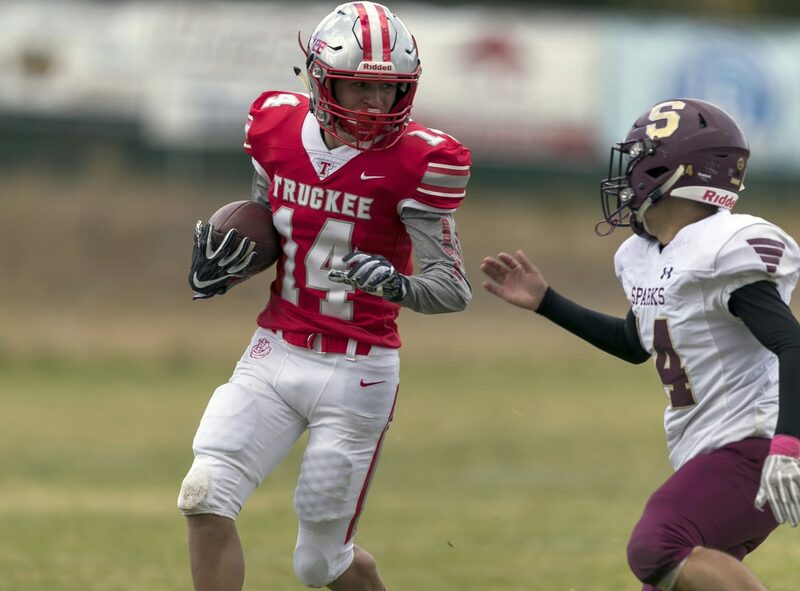 Truckee landed the knockout blow during the first series of the second half as senior running back Jackson Skaff shucked off multiple defenders on a trio of carries, before bulldozing his way into the end zone from a yard out to give Truckee a 35-7 lead. 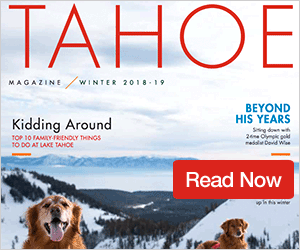 Conklin would add a second receiving touchdown on the next Truckee possession, pulling down an 11-yard catch for the score to start a running clock. 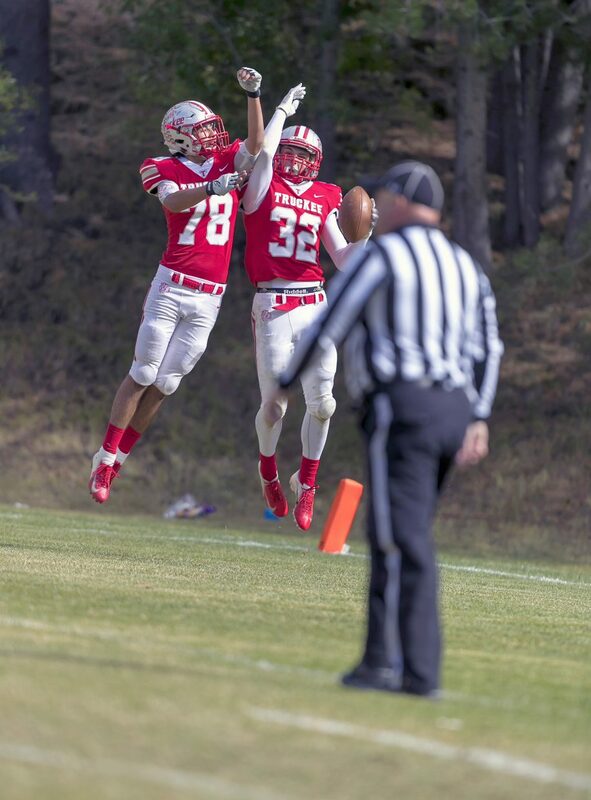 Conklin finished with a team-high 71 receiving yards. 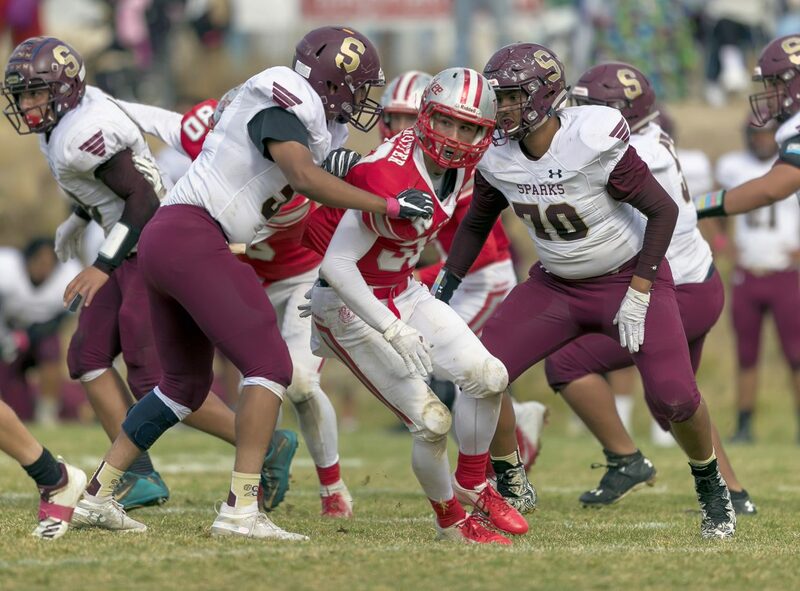 Senior Drew Wingard wreaked havoc in the Railroaders backfield all afternoon, and late in the game the linebacker dropped a Sparks ball carrier for a loss in the end zone, resulting in a safety. 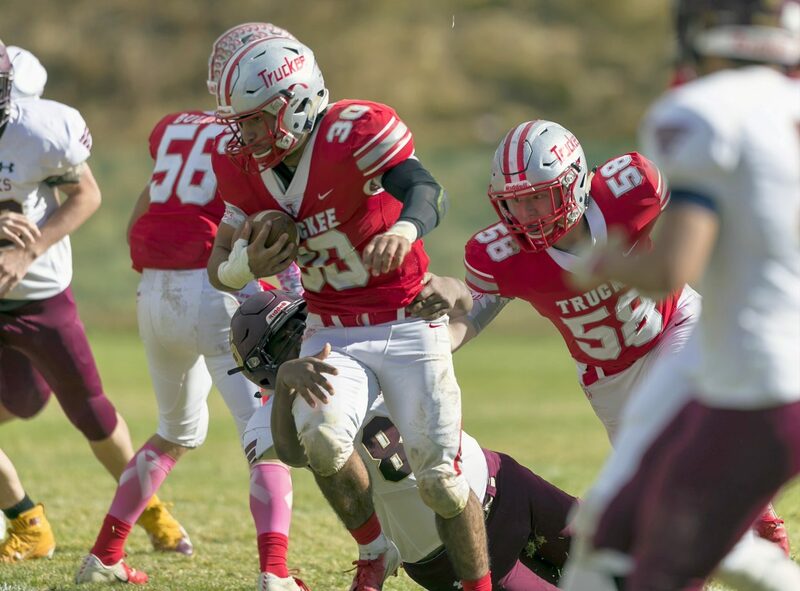 Wingard led Truckee with 14 tackles (11 solo), including four for a loss. 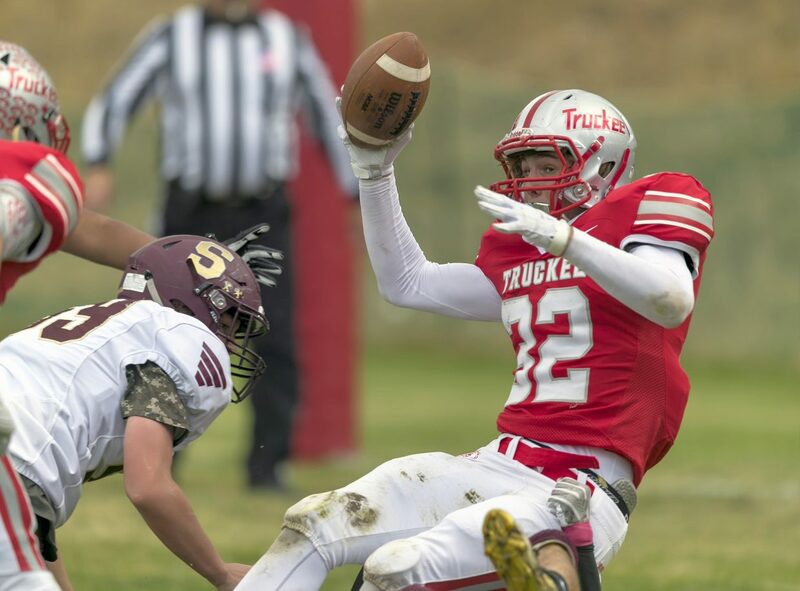 Truckee’s backups tacked on the final score of the game on a 15-yard pass from senior Dakota Allen-Gill to junior Tyler Estabrook. 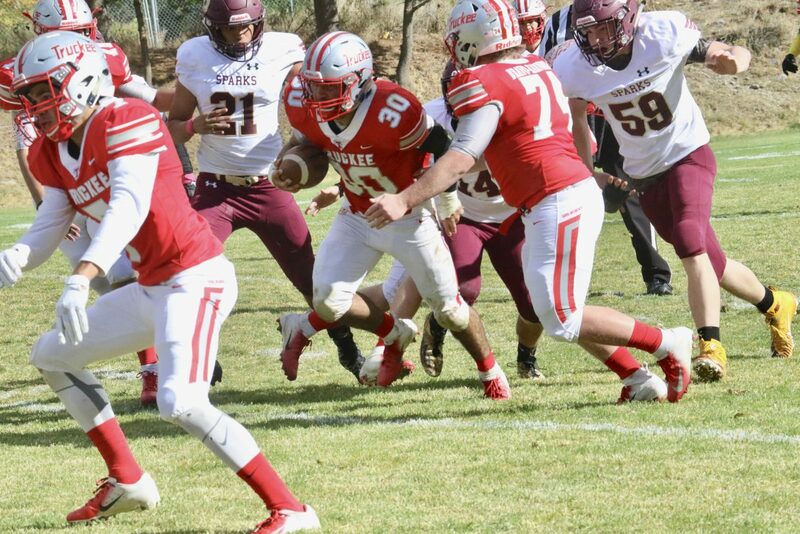 Senior Kevin Malo led the Truckee rushing attack with 62 yards on eight carries. 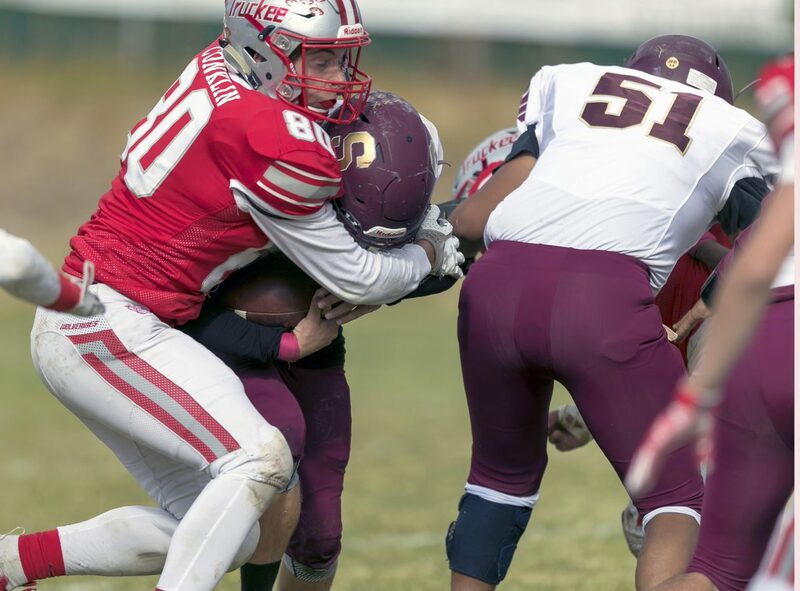 Senior Zach Charter picked up a sack. 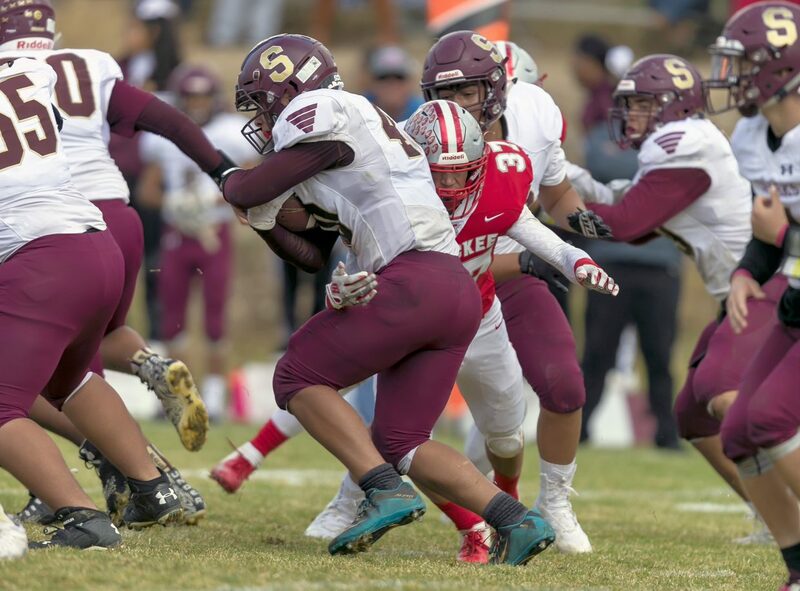 Skaff and junior Deacon Martin combined on another sack. 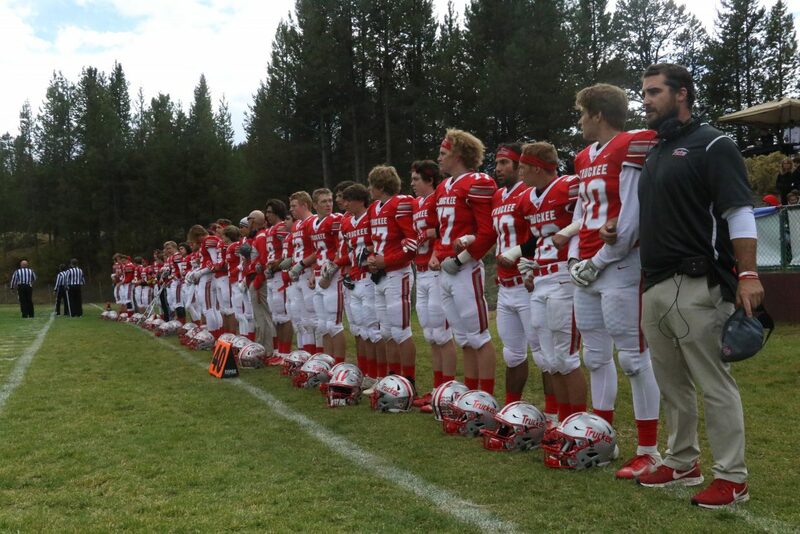 Though Truckee dominated the game, the Wolverines struggled to avoid drawing unnecessary flags and had 81 yards of penalties in the first half. 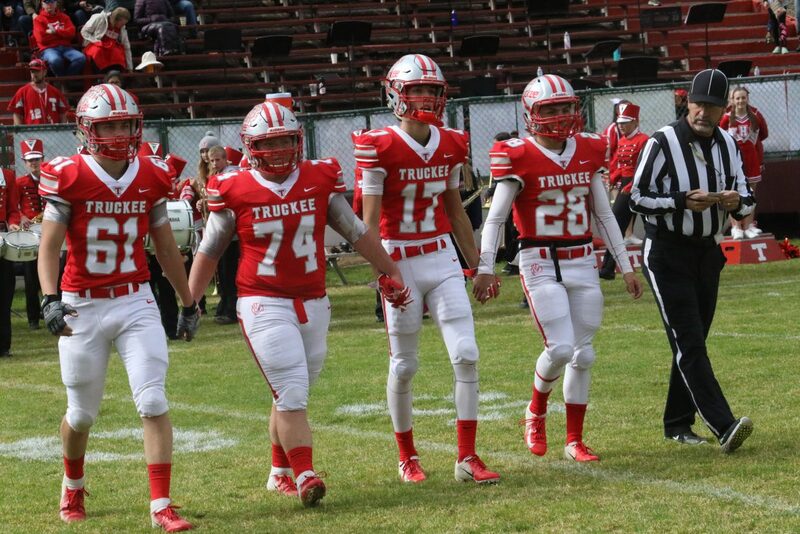 Truckee (7-1, 6-1 Northern League) will travel to Spring Creek (5-2, 5-2 Northern League) next Friday. 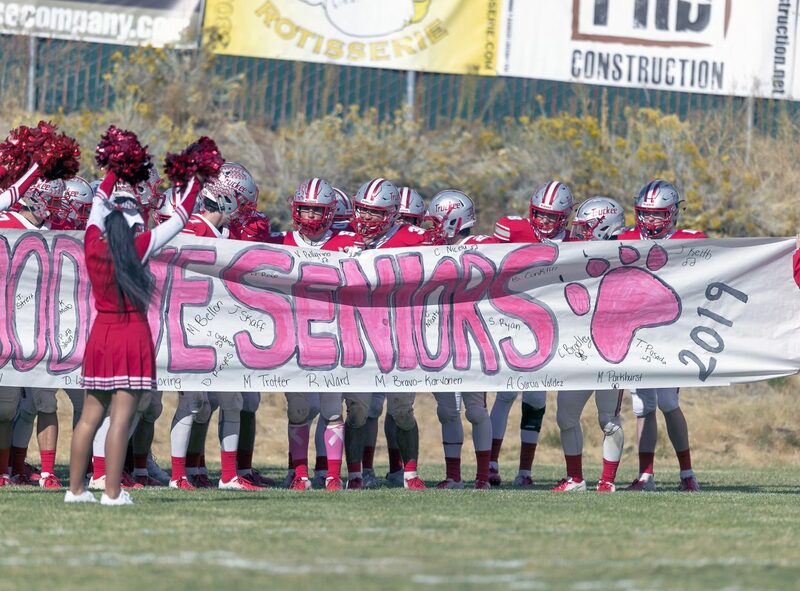 “Spring Creek can throw the ball. 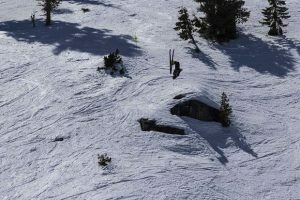 They are aggressive every year, and we’ve just got to be physical … things go well when you play hard,” said Head Coach Josh Ivens.